My first foray into the gun social media world was when I first logged on to GlockTalk as FillYerHands in 2008. Then came Twitter and this blog, and now I even have a Facebook page. When I started out, I never used my own name. Why? Well, for one thing, I was taking time at work to do the postings, in between my real job, recruiting. For another thing, I was afraid to use my real name, lest someone associate me with a Gun Crazed Maniac, and have that tarnish my business reputation. 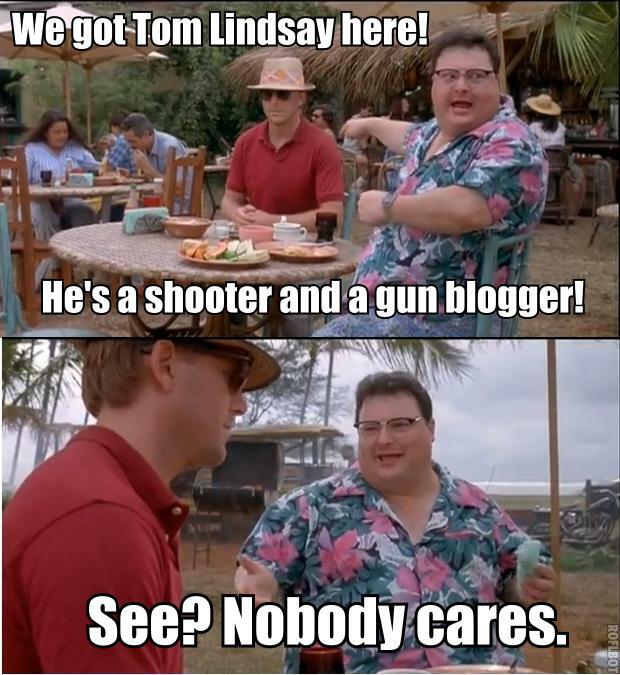 Having said that, over the past few years, I have met a lot of people in the gun world who have never had any issues with using their real names. Sure, there are a few folks who prefer anonymity, like Linoge, Uncle, and Sebastian. But there are lots more like Sean and Miguel and Ron and Walt, and a hundred more, forgive me for not naming you specifically. So as I have thought about it more, I have decided that I really don’t have any real reason not to use my own name. So I changed it Saturday on my Twitter page, and so far, not an eye has been batted that I can tell. I’m Tom Lindsay, and I live in the gun friendly town of Kennesaw, Georgia. I’m not an Operator. I’ve never been in the military or law enforcement. I’m just a regular guy who likes guns and shooting. I support the Second Amendment right to keep and bear arms. I’ve been shooting a little over 20 years, and I compete in USPSA and GSSF. I am a certified Glock Armorer. For money, I recruit engineers and manufacturing people for clients all over the USA. I’m a degreed chemical engineer, having graduated from Georgia Tech. Besides shooting, I love barbecue, jazz, bluegrass, cars, and a whole bunch of other stuff. I even blog about my barbecue efforts at SkinThatSmokeWagon. Is there a flag for this? To be honest, I was too lazy to come up with a cool name. Plus, I was sure that someone would put effort into figuring out who I was anyway, so why make it hard? I almost mentioned that you go the whole other way, with a name tag and everything. Maybe I should do that. Your flag? The Stars and Stripes. My legs are way too hairy. Nice to meet you, Tom! Hey, I understand completely. I just came to the point where I realized I didn’t have any good reasons.